4.1 "Broad Wall" and "Narrow Wall"
Within a few years it was decided to add a total of 14 to 17 (sources[which?] 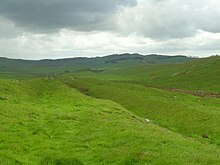 disagree) full-sized forts along the length of the wall, including Vercovicium (Housesteads) and Banna (Birdoswald), each holding between 500 and 1,000 auxiliary troops (no legions were posted to the wall). The eastern end of the wall was extended further east from Pons Aelius (Newcastle) to Segedunum (Wallsend) on the Tyne estuary. 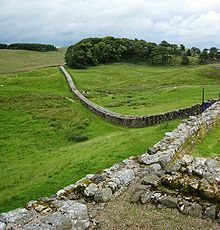 Some of the larger forts along the wall, such as Cilurnum (Chesters) and Vercovicium (Housesteads), were built on top of the footings of milecastles or turrets, showing the change of plan. An inscription mentioning early governor Aulus Platorius Nepos indicates that the change of plans took place early on. 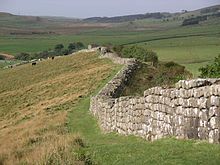 Also, some time during Hadrian's reign (before 138) the wall west of the Irthing was rebuilt in sandstone to about the same dimensions as the limestone section to the east. Leahill 51B is a typical example of the many turrets built into the wall between the milecastles. 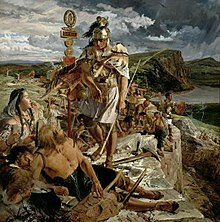 Painting by William Bell Scott; the face of the centurion is that of John Clayton (painting at Wallington Hall). Hadrian's Wall near Birdoswald Fort, with a man spraying weed-killer to reduce biological weathering to the stones. The remains of Castle Nick, Milecastle 39, near Steel Rigg, between Housesteads and The Sill Visitor Centre for the Northumberland National Park at Once Brewed. The 2015 film Dragonheart 3: The Sorcerer's Curse features Hadrian's wall as a main thematic element. ^ "Hadrian's Wall: The Facts". Visit Hadrian's Wall. 8 March 2016. Retrieved 21 February 2019. ^ "Obituary: Brian Dobson". The Daily Telegraph. London. 21 September 2012. Retrieved 22 September 2012. ^ "Hadrian's Wall: A horde of ancient treasures make for a compelling new Cumbrian exhibition". The Independent. 8 November 2016. ^ "More than 25,000 people see Hadrian's Wall lit up". BBC. 8 November 2016. ^ "Hadrian's Wall - English Heritage". 22 July 2004. ^ "Wall gains World Heritage status" BBC News. Retrieved 8 July 2008. ^ Centre, UNESCO World Heritage. "Frontiers of the Roman Empire". whc.unesco.org. ^ "BBC – History – Hadrian's Wall Gallery". Bbc.co.uk. 1 January 2013. Retrieved 26 March 2013. ^ Breeze, David J (November 2006). Handbook to the Roman Wall (14th – November 2006 ed.). Society of Antiquaries of Newcastle upon Tyne (1934). ISBN 978-0-901082-65-7. ^ Breeze, D.J. (2004). "Roman military sites on the Cumbrian coast". In R.J.A. Wilson; I.D Caruana (eds.). Romans on the Solway : essays in honour of Richard Bellhouse. CWAAS Extra Series. 31. Kendal: Cumberland and Westmorland Antiquarian & Archaeological Society on behalf of the Trustees of the Senhouse Roman Museum, Maryport. pp. 66–94. ISBN 978-1873124390. ^ a b c d e f g Anthony Everitt, Hadrian and the Triumph of Rome (2009), Random House, Inc, 448 pages; ISBN 0-8129-7814-5. ^ Unknown. "11.2". Scriptores Historiae Augustae. Vita Hadriani. ^ Breeze, D.J. ; Dobson, B. (2000). Hadrian's Wall (4 ed.). London: Penguin Books. p. 86. ISBN 978-0140271829. ^ Woolliscroft, D., 1989, "Signalling and the design of Hadrian's Wall", Archaeologia Aeliana 5th Series, Vol. XVII, pp. 5–20. ^ a b c d Breeze, David J (1934). Handbook to the Roman Wall (14th – November 2006 ed.). Society of Antiquaries of Newcastle upon Tyne. pp. 55–62. ISBN 978-0-901082-65-7. ^ Breeze, David J. (November 2006) . Handbook to the Roman Wall (14th ed.). Society of Antiquaries of Newcastle upon Tyne. p. 53. ISBN 978-0-901082-65-7. ^ Sheppard Frere (1980). Britannia. Routlege & Kegan Paul. pp. 158–160. ISBN 978-0-7100-8916-8. ^ Simon Schama (2000). A History of Britain. BBC Worldwide Ltd. pp. 34–37. ISBN 978-0-563-38497-7. ^ "Wall of Severus". Dot-domesday.me.uk. Retrieved 12 April 2016. 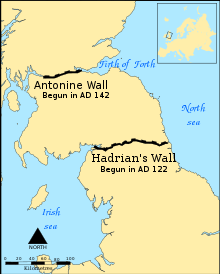 ^ "Hadrian's Wall". English-lakes.com. Retrieved 12 April 2016. ^ UNESCO World Heritage Centre. "Frontiers of the Roman Empire". Retrieved 26 November 2007. ^ "Hadrian's Wall Path". National Trails. Retrieved 26 November 2007. ^ "Every Footstep Counts – The Trail's Country Code". Hadrians Wall Path National Trail. Retrieved 26 November 2007. ^ Sycamore Gap, a section of the wall between two crests just east of Milecastle 39, is locally known as the "Robin Hood Tree" for its use in the 1991 film Robin Hood: Prince of Thieves (1991). ^ "The Staffordshire Moorlands Pan". British Museum. Retrieved 25 February 2019. ^ a b c d e f g Note the suffix "chester", reflecting the presence of a Roman castra. ^ "GENUKI: The National Gazetteer of Great Britain and Ireland (1868) – Northumberland". Genuki.bpears.org.uk. 3 August 2010. Archived from the original on 5 May 2013. Retrieved 26 March 2013. ^ Martin, George R.R. "A Conversation With George R.R. Martin". The SF Site. Retrieved 10 September 2011. ^ "MAXIM : HELLS KITCHEN - the album, scans and info". Nekozine.co.uk. Retrieved 12 April 2016. 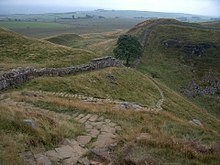 Wikimedia Commons has media related to Hadrian's Wall. 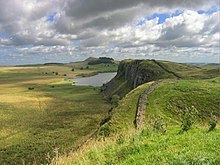 Wikivoyage has a travel guide for Hadrian's Wall.